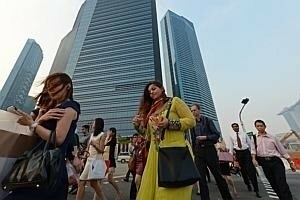 FINANCE managers, legal counsels, inventory managers and sales administrators are just four of the skills in demand as Singapore's expanding economy continues to create new jobs, recruiting experts Hays said on Tuesday. "Results from our Hays Global Skills Index published late last year show that Singapore received a talent mismatch index score of 5.9,'' said Chris Mead, Regional Director of Hays in Singapore & Malaysia. "This relatively high score means that the numbers of long-term unemployed and vacancies are both increasing, which suggests that the available labour does not always have the skills employers want." Mr Mead said that partly explains why demand for contract and temporary candidates is growing in Singapore. "We are seeing more contracting roles for Financial Analysts, all-round Accountants with SAP ERP system knowledge and Financial Planning & Analysis professionals," he said. According to the recruiter's latest Hays Quarterly Hotspots list of skills in demand for the April to June quarter, Singapore is seeing a spike in the need for legal counsels in the engineering and construction industry. Good growth in the economy has led to high demand for sales administrators as companies expand their revenue generating teams. "These people require a lot of after sales support to increase the pace of sales," Mr Mead said. Smaller and mid-sized banks, looking to expand their presence in Singapore, are keen on hiring all-rounded finance managers. Hays also noted that the continual flow of foreign money into Asia and Singapore means that almost every private bank in Singapore has a need to expand their relationship management team.